Gov. Larry Hogan and former and current economic development secretaries and staff. From left: Jim Brady, Aris Melissaratos, Hogan, Mike Gill. Larry Hogan, Jr. was elected governor partly because he promised to bring jobs and companies to Maryland and reverse the hostile, anti-business mindset of the outgoing governor (and current presidential candidate), Martin O’Malley. Six months later look at the results. Since Hogan took office in late January, 12 companies have notified the state they will close or impose mass layoffs, costing 1,439 Marylanders their jobs. The latest is the production crew of “Veep,” an award-winning HBO political comedy that has filmed in East Columbia and Baltimore for four years. The economic impact for the first three years of production: $114 million. A day earlier, U.S. Foods, Inc. announced closure of its distribution center in Severn in Anne Arundel County, a warehouse that employed 500 Marylanders. Next week, Labinal Power Systems will shutter its manufacturing plant in Salisbury, where 650 people made wire harnesses for military aircraft, including the Chinook helicopter. “Veep” is moving its film operation to California because of that state’s bigger tax credit. Safran, the French owner of Labinal, is consolidating operations in Texas; U.S. Foods is shifting its Severn jobs to Manassas, Va.
Hogan’s pledge to implement business “climate change” is not yet working. Sure, he proudly crowed about McCormick & Co.’s decision to build a large headquarters edifice in Hunt Valley rather than move its 2,000-member HQ staff to Pennsylvania or Virginia. But there’s hardly been a sea change in economic development. Unilever is moving its production of vegetable oil and margarine spreads, like “Country Crock” and “I Can’t Believe It’s Not Butter,” from Baltimore to Kansas. Job loss: 137. DynCorp International is shuttering its aviation support equipment facility at Solomons Island in Southern Maryland. Job loss: 121. Clothier Jos. A. Bank is displacing 122 employees at its Hampstead plant in Carroll County. T. Rowe Price is outsourcing 211 accounting and record-keeping jobs from its Owings Mills campus in Baltimore County. In July, 69 workers at Riverbed Technology in Bethesda will be jobless. In August, 54 workers at Orion Safety Products’ Easton plant in Dorchester County will be out of work. Meanwhile, the giant British firm, Diageo, is throwing 103 people at its bottling plant on Washington Boulevard in Baltimore County into the unemployment lines. This ends 83 years of liquor operations in the building: The Relay plant was Maryland’s first legal distillery. It opened in 1933 after the end of Prohibition. Seagram’s used to bottle Calvert whiskey there. Not exactly the kind of job-creating start Hogan had in mind. Of course, he did brag about the 16,300 jobs added overall in April and 13,500 in May — though he downplayed the 5,700 jobs lost in March. That’s pretty much in line with O’Malley’s uneven job-creating performance. What we’re seeing is the reality politicians don’t want to admit: They have, at best, marginal ability to influence the job-creation, job-loss decisions of private-sector companies. Larger macro-economic and macro-corporate factors are in play. Thus, O’Malley could do little to stem job losses during and after the nation’s Great Recession. Hogan can do little to overcome corporate consolidations or international and industry developments that influence CEOs. Yes, Maryland’s economic development team under Hogan is far friendlier and eager to make it simpler for businesses to re-locate to the state by easing their regulatory burden. But Maryland remains a relatively high-cost state for corporations, especially compared to neighboring Virginia and Delaware. Government red tape is terrible in Baltimore City and many of the state’s most populous counties. Hogan also is ideologically opposed to large financial giveaways to corporations — a form of economic bribery favored by many states. Thus, he failed to offer “Veep” a larger tax credit than California to keep the film crew in Maryland, even though the legislature had given him that authority. The loss of “Veep” and possibly “House of Cards” next year is a serious blow to a budding state industry. Just the economic impact of HBO film production in Maryland since 1997 is estimated at $300 million. Job losses from a diminished film industry could affect thousands of workers and businesses. According to Towson University’s Regional Economic Studies Institute (RESI), the average film production in the state spends $16.8 million, hires 746 Marylanders, calls on 857 Maryland businesses and vendors for accessories and supplies, and pays for 2,952 room nights in Maryland hotels. The average tax credit for a Maryland film production: just $3.3 million. But don’t expect Hogan to get in a bidding war for films with California or other states. How he intends to offset the job losses and lost spending isn’t clear. He faces more immediate and daunting challenges that could involve distasteful state subsidies to draw jobs to Maryland or keep jobs in-state. There’s the question of how to retain Marriott’s headquarters (2,000 workers) in Bethesda from moving to Virginia, which is eager to offer a bevy of attractive tax and financial incentives. There’s the question of winning the battle for a new FBI headquarters. Again, Virginia is offering a battery of enticements to the federal government. How can Maryland effectively compete when the governor is ideologically skeptical of lavish incentives? There’s also the matter of the rapacious owner of the Washington Redskins, Daniel Snyder, who wants to shake down Maryland, Virginia or District of Columbia for a new stadium that will cost him nothing, or next to nothing. These will be tough decisions for Hogan, especially with his dislike of corporate giveaways. 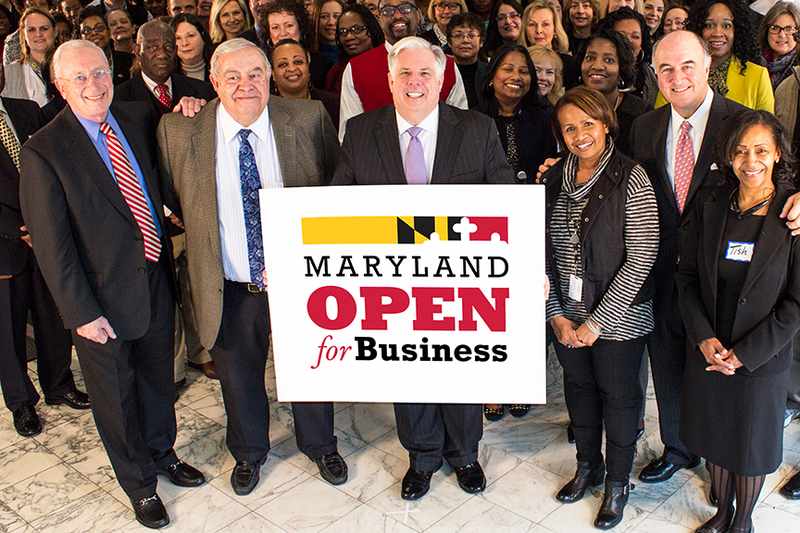 Yet proving Maryland is open for business may require more than easing restrictive regulations and putting a smile on the faces of Maryland’s economic development leaders.